"No love sincerer than the love of food"
My granny used to serve up butter beans and I hated them with a passion. As a kid I didn’t find the taste offensive, it was the texture which bothered me. For more than 30 (ahem) years I have declared butter beans as an evil food with a texture like ‘material’. Even I am not sure what that means, but I have stuck to this bizarre belief for a very long time. In the same month that I decided sweetcorn was not actually the food of the Devil (again something I had stuck to since I was about four) I decide to give butter beans a chance. I found this Chorizo and Bean Chilli recipe in a Weight Watchers cook book which B bought me (was he hinting at something one wonders!). It included the dastardly beans and although I thought about substituting them, I didn’t. And who would believe it, they were really rather splendid. Tasting them afresh after so long I couldn’t quite work out where my ‘material texture’ claims came from. They are I declare, beautifully soft and velvety buttons of goodness. 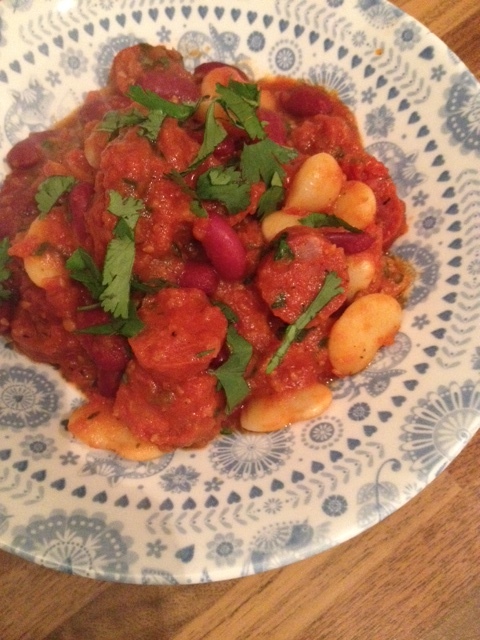 I changed this recipe a little bit to suit my tastes, first adding more chorizo than is called for. I love chorizo and therefore don’t like when recipes are mean about it. I also thought it was a sin not to add paprika to this dish. If you are using Hot Spanish Paprika perhaps halve the quantity – the heat in that stuff gave me quite a shock. I also added a bit of tomato puree just because and it worked well so I have kept that in too. This is an incredibly comforting dish which is super quick to make and has become one of our weekly staples. Serve with a nice hunk of bread and butter and a lovely glass of red wine. 400g cherry tomatoes, tablespoon of dried herbs, 1 400g can of kidney beans, 1 400g can of butter beans, 1 generous teaspoon of paprika, 2 red chillies, tbs tomato puree, 250g of Chorizo sausage sliced into coins, 100ml water. 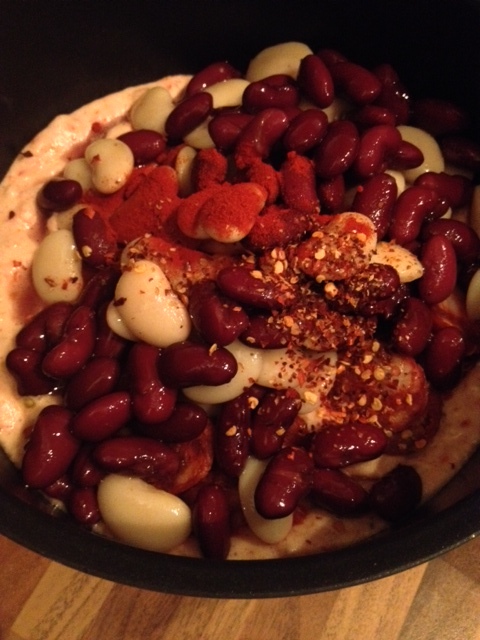 Categories: Uncategorized | Tags: butter beans, Chorizo sausage, kidney beans, material texture, tomato puree | Permalink.